The Op-ed was first published in the Business Standard on August 5 and mirrored in Organizing India Blogspot on August 6, 2015. Public opinion is conflicted, wanting better services at low prices, fearful of the hazard of more towers, while also wanting operators to pay dearly for spectrum through auctions. The government asserts there's enough spectrum and operators need only to invest and deliver. Can these be resolved to get better services? There are several elements in this situation relating to technology, to the regulatory aspects of administration (policies and regulations), or to management aspects (structure, organisation and processes). Understanding these and managing them will be crucial in devising solutions. First, an overview from a lay perspective. An operator runs a number of "cell towers" connected together, as well as to other operators' towers (mobile networks) and fixed networks. A cell tower in its simple form - for one operator, covering one cell/area - comprises a base transceiver station (radio), antenna (mast), and other equipment. Radios need spectrum for wireless communication between towers, and subscribers linked to towers. Apart from spectrum and licensing costs, the number of towers in an area drives the capital and operating costs, materials and energy used, and the environmental impact. As each tower covers a number of subscribers and spectrum is used for wireless connections, more subscribers need more spectrum. So, a given set of towers provides greater traffic-carrying capacity if there is more spectrum. Conversely, less spectrum requires more towers and equipment, which means higher costs and environmental impact. In other words, for a given frequency range (spectrum band) and set of towers and subscribers, a small set of broader bands can carry more traffic than can a large set of narrower bands. Calls get dropped or blocked if there is too little spectrum for the number of subscribers, because the calls exceed the spectrum's carrying capacity. Users get good reception if they are near towers, but if other towers are too close, interference from signals from those towers can reduce the capacity of available spectrum, and reception may also be noisy. A weak connection with a distant tower results in poor reception. Distance cuts both ways: a short distance from tower-to-user yields a good connection (strong signal), but other towers must be far enough to avoid interference (i.e., have weak signals for the user). For 900 MHz with a mast height of 10 metres, this tradeoff results in distances between towers of under 100 metres in Delhi because of the scarcity of spectrum, compared with 200 metres in Istanbul, 300 metres in Munich, or 350 metres in Berlin. An additional benefit of more spectrum is that peak-hour capacity increases, so that more traffic can be carried without calls being dropped or blocked over the same network configuration. Our problem is that we have many operators with narrow, non-contiguous slivers of spectrum. This further reduces the efficiency of the available spectrum. A reduction of towers because of closure on account of public pressure or for environmental reasons creates genuine problems, but simply adding towers is only a partial solution, as it doesn't remedy the shortage of spectrum. One reason is interference resulting in the reduced capacity of available spectrum - because cells in our urban centres are less than 100 metres apart, much less than in other countries, because sufficient commercial spectrum hasn't been made available. Therefore, more towers alone will cause spectrum to be used less efficiently, but won't reduce dropped calls arising from insufficient, fragmented spectrum. Also, adding towers is expensive, and is detrimental to the environment. Operators deal with scarce spectrum by deploying more base stations per unit area, and also by using advanced technologies such as adaptive multi-rate codecs and synthesised frequency-hopping. In 2008, Indian operators were among the few worldwide to adopt such techniques, while having the smallest outdoor sites and heaviest traffic densities per MHz. This results in higher costs relative to revenues. Comparing the approaches taken by China and India, there's little doubt of the need for a change in our approach. China provided operators with low-priced spectrum to scale up and drive economic growth, among other forms of support. Despite foreign holdings, it hasn't imposed substantial fees. India brought in more operators than other markets, didn't provide as much commercial spectrum, fragmented what it had, and priced it out of sight. Consequently, substantial spectrum is idle with the government, while large operators with very little spectrum and the legacy of underdeveloped fixed networks have over 100 million customers each, with high voice and growing data usage. This situation is likely to worsen as more spectrum holdings come up for renewal. Efficient data transmission requires even broader bands. 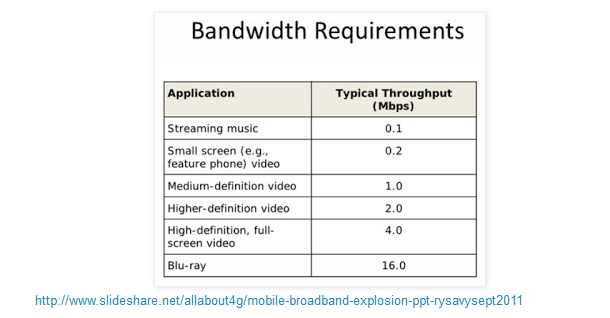 The charts below show how capacity increases per MHz with broader bands, and the bandwidth in terms of megabits per second (Mbps) needed for services. One possibility is to adopt policies and regulations that facilitate spectral efficiency, e.g., allowing roaming and spectrum trading. This wouldn't mitigate the problem of excessive capital expenditure on spectrum auctions that exceeds investment in networks (according to an industry estimate), but would probably improve spectrum utilisation. Another is to share all spectrum through pooling, allowing common-carrier access on payment to Radio Access Networks including spectrum. If charged only a reasonable revenue share with incentives such as reductions for rural services, there is likely to be explosive growth in broadband delivery with an increase in government revenue, if the organisation and coordination is done right. The government needs to bring together operators and other stakeholders, including the Ministries of Communications & Information Technology and of Information & Broadcasting, and with expert help, work out how to organise and deliver the promise of Digital India.
. For GSM, there is a 50 per cent increase in the capacity per MHz using two channels of 12 MHz each instead of two channels of 6 MHz each. Ibid., 15.